Back in July, I did a length check, and I was tailbone length. It was nice to have reached my original hair length goal, but I'm still wanting a bit more. My hair isn't exactly where I want it to be (within the bounds of my hair type and texture); I feel it should be at full tailbone length and look fuller. Truth be told, I've been slacking on my regimen, which has caused some of this. I haven't been protective styling as often, and my wash schedule has been all over the place. This has unfortunately caused a lot more breakage and damage. So what better way to resolve these issue than to do a hair challenge! 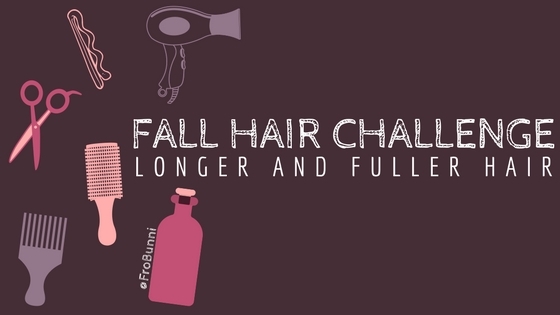 This hair challenge will focus on reducing breakage and growing thicker hair (read: a more uniform length). By the end of it, I should have greatly reduced my hair breakage, as well as be full bra strap length wearing a typical stretched hairstyle like a roller set or braid out. 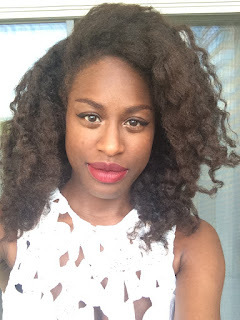 Let's Discuss this "Eat Healthy"
The longer I blog about hair, the more I realize how a healthy diet and healthy hair are connected. This doesn't mean you can't have healthier, longer, fuller hair without a healthy diet, just that it can help, and for some women, it's key. Plus, what's the point of having long hair if you're too sick to enjoy it? Since I've been doing the IIFYM (if it fits your macros) diet, I've noticed how much better I feel when I get enough calories and nutrients, compared to when I don't. And I know if I can consistently do this, it will translate into healthier hair. So with this hair challenge, comes a healthy diet component. While my hair rules can be applicable to many women (they're pretty generic if you think about it), my "eat healthy" can't. A healthy diet isn't going to be the same for everyone, so it's not something I recommend you follow. If you are trying to eat healthier, I recommend talking to your doctor or finding a registered dietitian. It's fairly simple, but still very personalized to fit the shortcomings in my diet. Later in the week, I will discuss the new multi-vitamin, as well as the age old question "Do hair vitamins work?" Are you thinking about doing a hair challenge? Let me know in the comments!